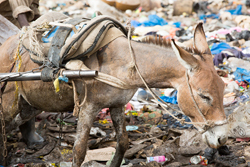 Animal welfare charity SPANA has launched "International Working Animal Day", to raise awareness about the vital role played by working animals in developing countries around the world. Working animals - such as horses, donkeys and camels - are relied upon by one billion of the world's poorest people for their livelihoods. More than 200 million working animals worldwide do the jobs of trucks, tractors and taxis and, by transporting goods and people, make it possible for impoverished families to earn a living. Yet, survey results show that a third of people in the UK don't know what a working animal is. Despite their importance, these animals often lead short, hard lives, with tough working conditions, inadequate nutrition and no access to veterinary treatment. SPANA works in developing countries throughout the world, providing free veterinary care to sick and injured working animals, as well as working with communities to improve animal welfare through education and training. However, the sheer number of working animals globally means that there are still millions of animals that currently have no form of veterinary treatment available to them. Jeremy Hulme, Chief Executive of SPANA, said: "Working animals are fundamental in providing a means of income for millions of poor families. But, this vast global workforce is largely unknown and ignored. "In western countries working animals helped build our towns and cities, farmed our land and were our main source of transport for thousands of years. It's a bond many have forgotten - in the UK, one in three people now don't even know what a working animal is. However, they are still as vital to people in developing countries today as they were here a century ago. "We believe that these animals deserve greater recognition. And, more importantly, they need our help. Many animals live and work in appalling conditions, without the care they need. But a life of work shouldn't mean a life of suffering." TV star Paul O'Grady said: "It breaks my heart to see how hard horses, donkeys, mules and camels have to work around the world, pulling carts and carrying heavy loads. Despite how important they are, many will lead short, painful lives. Hardly any receive even basic vet care when they're sick or injured, as it's often not available and their owners simply can't afford it. They deserve better. "That's why I support SPANA, the charity that gets free lifesaving vet care to working animals. Today I'm asking you to join me in backing SPANA's International Working Animal Day. We need governments and aid organisations around the world to recognise the massive contribution of working animals and to make sure they get the treatment, care and compassion they deserve."